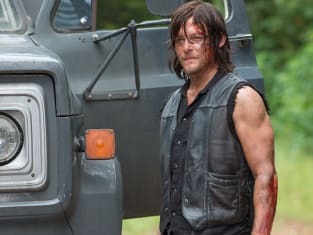 One moment you and the woman you like are dressed in your best guts-covered outfits, taking a night stroll through a zombie-filled neighborhood, and the next, she and her kids are getting ripped apart by walkers, you have to hack her hand off, and you see your own kid get shot in the face. Sorry, Rick, but that whole Brady Bunch concept with Jessie isn’t going to work out after all. The Walking Dead Season 6 Episode 9 was an entertaining hour with plenty of surprises and action that ultimately concluded the attack on Alexandria with a look to the future. It was a major step up from the lackluster The Walking Dead Season 6 Episode 8. 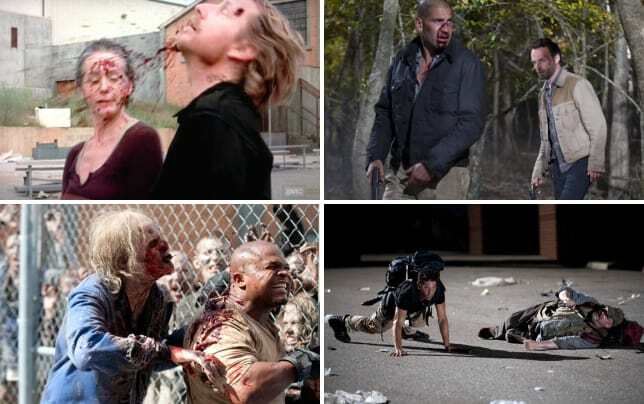 Right from the outset, the fate of characters seemed up for debate, and I wasn’t sure if Daryl, Sasha and Abraham would all make it out alive. Would the midseason premiere be that ballsy to kill one of them right in the opening moments? No, but it offered up a fantastic alternative surprise as Daryl used the rocket launcher to blow away the Sons of Anarchy blocking their way. If anything, the cold open successfully name dropped a new foe for the survivors to face: Negan. Let’s just hope he proves to be a worthy and scary threat. I’m very curious to see what type of presence he brings. But the hour was much more focused on closing a chapter in Alexandria, bringing all the characters into play (even some of the one’s that have been noticeably absent in the past few episodes) to unite as one group. It was a positive shift for the series and for The Walking Dead Season 6 after having delved into the Rick and company vs. Alexandria residents for a while. Seeing each member come out of their home to aid Rick in what felt like an endless slashing and cutting down of walkers – even Eugene wasn’t “clocking out” for this battle – further reiterated that concept. Additionally, the way the scene built up in both the music and the quick-cut editing between the characters before closing on Rick really added to the intensity of the battle while adding a certain emotional weight to it all. I still think Rick was crazy for leaving the house to face the walkers all on his own, even if it is Rick and Rick is (probably) definitely not going to die anytime soon. But I guess he felt he needed to do something more than just sit and wait. That and the shock of watching Jessie, Sam and Ron get ripped apart by walkers and then seeing Carl shot in the face and possibly on his deathbed added to his decision. Because while Daryl’s use of the rocket launcher or Abraham and Sasha showing up to save Glenn (but, seriously, after the mess the show put viewers through with Glenn’s “death,” did anyone really think it would just kill him off right when the season returned?) were great surprises, the triple kill followed by Carl’s missing eye was a stunner. The whole moment felt surreal that I almost kept thinking I was watching some nightmare dream-sequence. I guess someone should have told Sam that there was a no talking policy when it comes to wearing zombie camouflage. And Ron shooting Carl? Ugh. Even the Wolf that kidnapped Denise found a way to do something good before he was taken out. Ron’s just going to go down in The Walking Dead history as another unlikable character. Though, I still don’t really buy the sudden and drastic change that one Wolf had in helping save Denise. What the heck happened to the creepy guy from earlier in the episode or even the crazy one that told Morgan he was going to kill everyone? It just felt like a really forced way to give him some small redemption, even with the dialogue Denise provided after he was bit. Though, killing him off seemed necessary in closing that first chapter for Alexandria. The Wolves are no longer the big threat. And thank goodness we aren’t going to get an episodes-long rescue mission for Denise. This action-heavy hour was a satisfying return. With some shocking moments, plenty of zombie goodness, a united Alexandria by the end, and a tease of what’s to come, the midseason premiere was a great way to kick off the second half of The Walking Dead Season 6. Were you shocked by those deaths? Are you excited for Negan? What's next for Rick and the survivors? Sound off below! And don't you want to see the episode again? Then watch The Walking Dead online now! NOTE: The Walking Dead Season 6 Episode 10, "The Next World," airs Feb. 21 at 9 p.m.